Officials have yet to determine the origin of the Santa Rosa wildfires. However, dry and powerful "Diablo winds" that blow in overnight may have stoked and spread the infernos. Satellites in space are recording shocking views of the disaster, an event that some experts are calling one of the worst firestorms in the state's history. On Wednesday night, DigitalGlobe — a satellite imaging company that captures 100 terabytes' worth of new photos of Earth each day — released some of the first close-up views of the disaster from orbit. 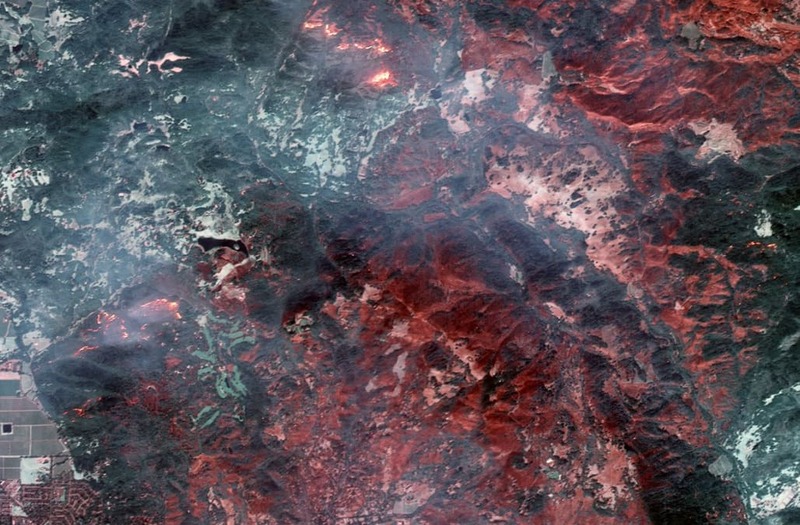 This image, taken by WorldView-3 on Tuesday, shows the Santa Rosa area of Northern California burning. These images were taken in infrared, which can travel from the ground, piercing the veil of thick smoke, and be detected by the satellite's SWIR sensor. Gray areas are burned, and red areas are vegetation. The bright line snaking through the hills of the area is the fire line burning through new material. This zoomed-out view shows northwest Santa Rosa and Coffey Park — parts of which were decimated by the flames. All of the gray regions are burned-down homes, while red shows relatively unscathed plots of land. Coffey Park's central grassy lawn avoided the inferno that tore through the residential neighborhood. This image, taken by GeoEye-1 on October 11, shows burned wine country. These vineyards' wine production facilities and tasting rooms were torched to the ground, though many rows of grape vines appear to have survived (again, red is healthy vegetation). Neighborhoods clustered around the Fountaingrove Golf and Athletic Club — located just a few miles from Coffey Park — were also destroyed. Though some golf course shrubs and trees survived, the surrounding homes were scorched to ashes. "Although there is a lot of smoke in the area, shortwave infrared (SWIR) can penetrate the smoke and detect heat beneath," DigitalGlobe wrote on its website. The company took the following images on October 10 and 11 with its WorldView-3 and GeoEye-1 satellites. "Some of these are natural color, while others are shown in the Very Near Infrared (VNIR), where burned areas appear gray and black and healthy vegetation is red," DigitalGlobe told Business Insider in an emailed statement. Melia Robinson contributed reporting to this post.